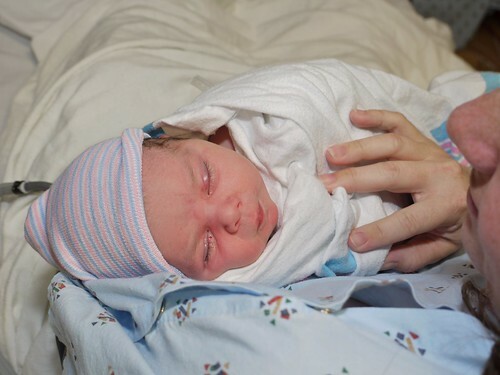 Since the hospital had Wifi, Leah got to experience her first videoconference within a couple hours of her birth. That's Aunt 'Chelle, Uncle J, and Cousin Emmie on the other end. - As Chad was coming back from lunch on Wednesday, he passed a couple clearly in labor. She was in the wheelchair focusing on her breathing while quickly being pushed by her husband. Chad's though as he walked by was, "Oh, that's what that's like!" - You'll never see as many men carrying Vera Bradley bags as you will in Labor & Delivery. - When Chad went to change Leah's diaper after she was brought to us in recovery room, he realized that she was wearing a size 1 diaper. We couldn't believe it! So much for that box of newborn diapers. - We ordered breakfast from the hospital's food services every morning. The first morning I ordered an abundance of food for both Chad and I and was not questioned. However, when Chad ordered both Fruit Loops and Raisin Bran the second morning, she lady on the phone said, "She wants both Fruit Loops AND Raisin Bran?" Why yes, yes she does. Leah was born Wednesday, Sept. 16th at 10:29pm, weighing 9 lbs. 1 oz. and 20.5 inches long with a full head of hair. As most of you know, I was induced due to being 10 days late. Pitocin was started at 10:30a. 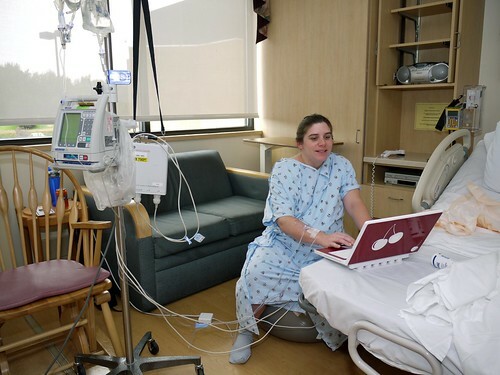 Labor began progressing, but very slowly, so I thought it would be a good time to browse the web and send a few emails thanks to the free wi-fi at the hospital. I ordered the epidural at 5 cm and was comfortable by 6:00p. The second half progressed much quicker. At 9:55p I felt a lot of pressure, and then my water broke. I was checked and was 9.5 cm. I was instructed to push at 10:09p and at 10:29p Leah was born. Only 20 minutes of pushing!! I was thrilled that the whole process only took 12 hours, compared to the 30 hours it took for Molly. And we were shocked at how big she was too since Molly was just under 8 lbs. 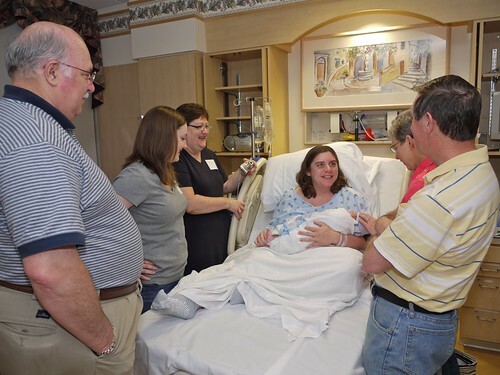 G'Mom, Grampa, Grams, Pop, and Aunt EA were all waiting to meet Leah and hear her name. We picked the name Leah simply because we liked it and it met all our criteria, and Rose was my great-grandmother's name. You can see pictures from her birth day here and stay tuned for more! A high five and a kiss for "baby ister." It started about two weeks ago while preparing for Michelle and Emmie's visit. Chad was up and down from the attic several times getting down boxes of clothes and nursery bedding. I washed all of those plus the burp cloths and crib sheets. 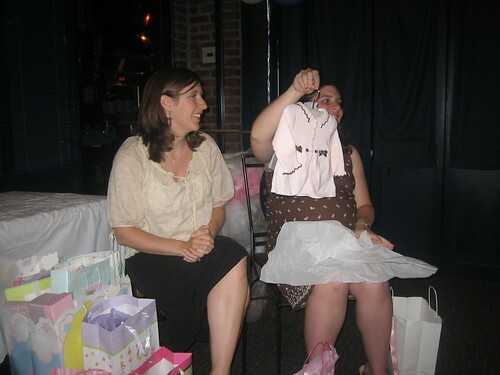 I never knew how many newborn and 3 month clothes we really had! And on top of that, we got even more cute clothes at my Sprinkle. Yesterday, I got a pedicure in the morning, and then a hair cut in the afternoon. I wanted to get both of those done just in case this little girl decided to be the opposite of her big sister and come early! So, Chad and Molly spent a lot of time together. I've even made sure that all the bills are paid and gathered together our insurance reimbursement papers. What do you think, is the nesting in full swing?! While Michelle was here, she and two friends, Christy and Emily, threw me a "Sprinkle." Jen and Chad are having one more. This is just a "sprinkle" to show that we care. She will need some of her own clothes that are new. This little girl is going to be stylin' in all her new clothes. 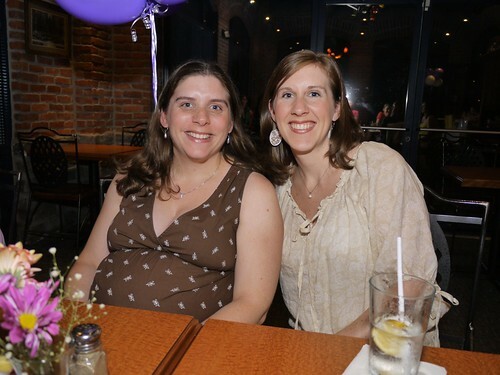 It was a great evening and a fun way to do something little to honor Baby Girl #2. Thanks to everyone who came! You can see the rest of the pictures from the Sprinkle here. Molly occasionally will tell me, "Let's find baby ister" and then proceed to lift up my shirt. She'll point to my belly button and say, "There she is!" We also talk about how big mommy's belly is, and she'll lift her shirt and say that she has a big belly too. Today we had our last follow-up ultrasound. We took Molly to this one. She liked pointing out baby ister's mouth and nose. Yet again, everything looked great. The biggest surprise was when the ultrasound tech told us that Baby Girl is measuring 6 lbs. 6 oz. My response was, "Already?!" That explains those sweet chubby cheeks! 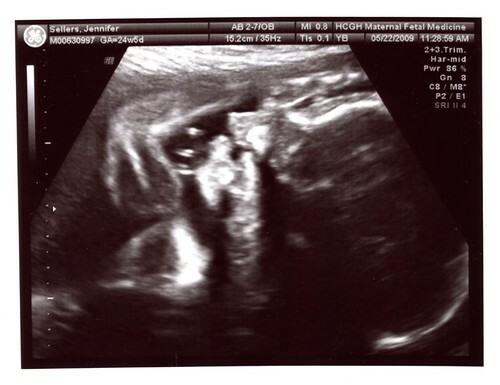 We had yet another follow-up ultrasound last week. Everything looked great with Baby Girl. She is measuring right on track, and is roughly 3.5 lbs. 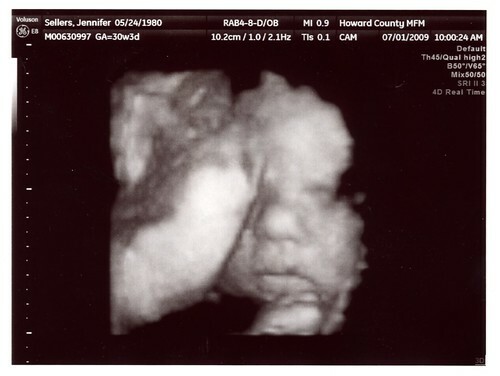 They were able to print some 3D images of her for us, so here's another glimpse of her sweet little face. 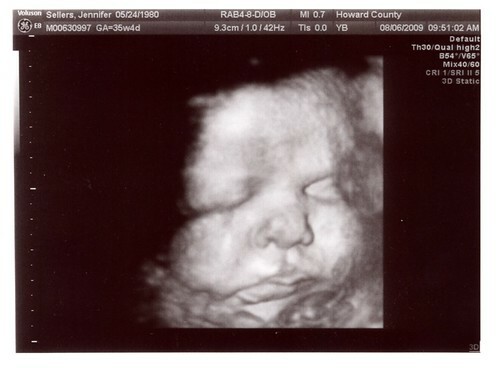 We did a 3D ultrasound for baby #2 on Friday, which is very cool if you've never seen one. She cooperated very well, though the umbilical cord was in her face the whole time. Here's the video of the whole session (which is quite large and lasts 17 minutes). And if you'd like to see some still pics from our session, they're available here. We had a follow-up ultrasound yesterday. 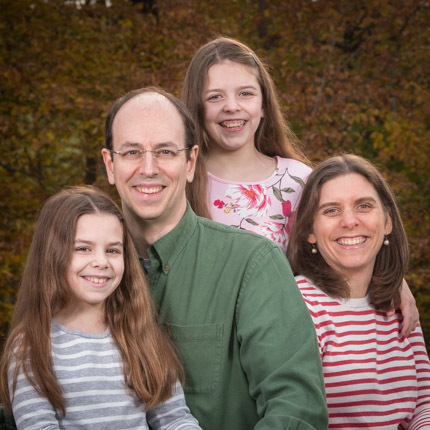 The main reason was to do an in-utero Echo due to our family history of heart murmurs. We got good news all around. The baby's heart looks great, and as far as the doctor could tell, the baby did not inherit Chad's heart murmur. I am also no longer at risk due to a low-lying placenta. We'll go back again in July for another follow-up to check on some fluids and measure the baby's growth. Currently, she's measuring in the 66% on growth. Here's her newest portrait. Yes, it is the same pose she showed us in April. It looks like she's got her hand on her forehead, stressing about all this growing she's got to do!